Popular songbirds like sparrows, finches, wrens and robins, as well as other artist favorites like eagles, hummingbirds and swans. 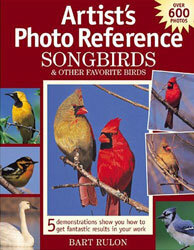 Songbirds has more than 50 birds not included in Rulon's first reference. 5 painting demos that illustrate how successful artists use reference photos to add realism to their work. A welcome variety of scenes and positions--birds shown close up, in natural habitat, individually and in groups--to suit artists of many different styles and interests. As an added bonus, the introduction offers tips on how artists can save money by taking their own photos to expand their reference collection even more!